A federal reserve study concludes weak demand in the housing sector is structural and will not be corrected by low mortgage interest rates. The federal government set up the unemployment reporting procedures to mask the depth of problems with deep recessions. During the Great Depression unemployment hit very high levels because the government counted everyone who wanted a job but didn’t have one. During the Great Recession, many people fell off the reported unemployment statistics because after a certain time, the long-term unemployed are deemed to be no longer looking for work even if they are. The sharp decline in the labor participation rate in the Great Recession reflected the large number of people who were unemployed so long they were dropped from the labor force entirely. This made the reported unemployment rate look better than it was, which is why the government manipulates the statistics this way. The change in the labor participation rate has big implications for the economy, monetary policy, and the housing market. If we assume the decline in labor participation rate is temporary and discouraged workers will return to the workforce, then stimulatory monetary policies like quantitative easing and zero percent interest rates will eventually put these people back to work (at least the federal reserve hopes so). If these workers go back to work, they will ultimately buy homes, and sales volumes and sales prices will increase. However, if the decline in labor participation rate is the early retirement of baby boomers, then these workers will not return to the workforce, and stimulatory monetary policies will be ineffective. Further, without increased labor participation, the workers who would buy homes from the baby boomers at inflated prices won’t materialize, and the housing market faces an intractable problem with long-term demand. Considering the federal reserve has lowered interest rates to zero and printed trillions of dollars, it would be logical to assume they believe the labor participation rate will improve and they should continue stimulatory monetary policy; however, their economists are suggesting otherwise. A decline in the share of Americans holding or seeking jobs is largely the product of longer-term factors such as a rising number of retirees rather than the aftermath of a particularly awful recession, economists at the Federal Reserve board say in a new paper. The U.S. labor force participation rate was 62.9% in July, down from 66% in December 2007 when the recession began and a peak above 67% in 1999. Fed officials have long debated how much of the recent decline in labor force participation is “structural,” and therefore more intractable, or “cyclical,” the result of an unusually weak economic recovery. The difference matters for the central bank because the latter type is more likely to be reversed by Fed policies aimed at boosting economic demand, such as holding interest rates very low. The hope has been that if the economy strengthens, some people who have stopped looking for work—and therefore aren’t counted as part of the labor force—would return to the job market. But if the drop is mostly structural, then very low interest rates aren’t likely to make much difference. The new research comes down squarely on the structural side of the argument. The most recent debates around federal reserve policy has been around when they would start raising interest rates. Most assume they will leave interest rates down for too long and accept a moderate amount of inflation; however, if they believe the problem is structural, they may not follow that course. They may raise interest rates sooner to keep inflation low. “Much of the steep decline in the labor force participation rate since 2007 owes to ongoing structural influences that are pushing down the participation rate rather than a pronounced cyclical weakness related to potential jobseekers’ discouragement about the weak state of the labor market,” several top central bank staffers write in a paper set to be presented at a Brookings Institution conference next week. If they are right, this has major implications for housing. The low demand we see today may be a long-term structural problem with the housing market. Improving employment and wages may not have a major impact on housing because the raw numbers needed to really move the housing market is absent. It also suggests that homebuilding stocks may not be a great investment as demand for new homes will be low for the foreseeable future as new workers buy the existing houses of baby boomers. 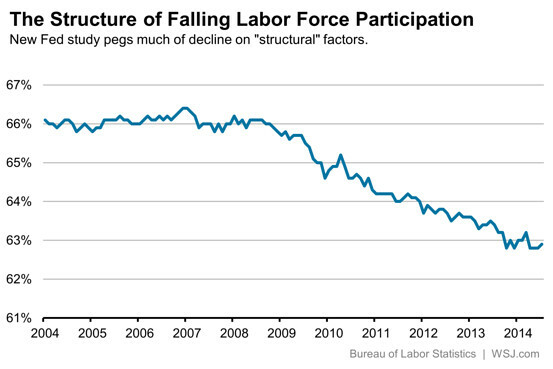 When Yellen made that speech, she obviously believed the problem is not structural. Will this new paper change her mind? If so, how will that impact monetary policy? When Ms. Yellen spoke in March, the nation’s jobless rate was 6.7%. It has since fallen to 6.2% in July. She has said recently that if improvement in the labor market continues to be more rapid than Fed officials forecast, they could raise interest rates sooner than widely expected. Many investors are expecting the first rate hike in the summer of 2015. However, following some costly head-fakes in recent years, officials want to make very sure economic growth and job creation are sustainable before taking their foot off the gas—particularly with inflation still comfortably below the central bank’s target. Personally, I don’t believe this report will have much impact. The federal reserve won’t raise rates until inflation forces them to, and that won’t happen for a while. If we have structural unemployment problems, we may not have any inflation for a long time. Interest rates may stay low longer than people expect, not because the federal reserve tolerates high inflation but because the inflation doesn’t materialize. After last week’s poor adjustment for the holiday, loan applications are “surprisingly” much higher this week. Mortgage applications jumped dramatically for the week ending Sept. 12, up 7.9% from the week earlier, according to data from the Mortgage Bankers Association’s Weekly Mortgage Applications Survey for the week ending Sept. 12, 2014. This erases the 7.2% drop the week ending Sept. 5, with twice as much of a gain among refinancings as purchases. When the Federal Housing Finance Agency implemented new representation and warranty policies for Fannie Mae and Freddie Mac on Jan. 1, 2013, it did so in a rushed and flawed manner that exposes the government-sponsored enterprises to significant risk, the FHFA’s watchdog said in a new report. But according the FHFA-OIG, the changes were implemented far too quickly and did not allow the GSEs to fully implement the processes, procedures and systems either would need to operate within the new framework by the established start date of Jan. 1, 2013. According to the OIG report, Freddie Mac said, in a risk analysis published in August 2012, that it would need two years to fully update its systems, including the creation of two new systems to track loan level data and to allow sellers to receive feedback on mortgage risk and appraisal quality prior to loan delivery, to support the new guidelines. “Despite FHFA’s awareness that Freddie Mac would not have the systems and tools in place it deemed necessary to help identify non-compliant loans and reduce credit losses, FHFA continued with its Jan. 1, 2013, implementation for the new framework,” the OIG report said. Fannie Mae also told the FHFA that it needed a significant amount of time to update its systems and, as of July, still had not fully enhanced its systems to the appropriate level, according to the OIG report. Fannie said that the completion and full rollout of those systems is projected to occur in late 2015. As with Freddie Mac, the FHFA did not determine whether Fannie Mae had the necessary systems in place to support the framework, the OIG report said. “As a result, there is an inherent risk for potential errors and the Enterprises may experience credit losses that otherwise may have been mitigated through use of contractual remedies such as repurchases,” the OIG said in its report. Although millennials are moving out from their parents’ homes, they are still not buying their own places. According to an article in CNBC, they are choosing to rent instead. Millennials will spend $1.6 trillion on home purchases and $600 billion on rent over the next five years, more per person than any other generation, with more of them opting for more affordable rents versus paying the big price tags to buy homes. While most millennials aspire to be homeowners, the article explained that the difference between them and other generations is that their time horizon for home ownership will be shorter. Iowa’s most famous home – with apologies to gubernatorial mansion Terrace Hill and the gruesomely infamous Villisca Axe Murder House – is vacant again for the first time in four years. The American Gothic House in Eldon soon could be available to rent to another restless soul who might like to escape to a town of 900. Or perhaps an aspiring artist-in-residence will come in search of rural inspiration. Beth Howard, born and raised in nearby Ottumwa before she sought far-flung adventure, returned to Iowa and moved in four years ago as a grieving 48-year-old widow with designs on writing a book. “I needed to be somewhere that was nurturing and grounding,” she said at the time. During the four years she lived there she became the “Pie Lady” and “Ms. American Pie” through her memoirs and recipes, pie-baking classes, “World Needs More Pie” blog, stints judging at the Iowa State Fair and her own “Pitchfork Pie Stand” run out of the Gothic House. Howard baked thousands of pies there (apple, strawberry crumble, peach, etc.). She posed in hundreds of photos (not always wielding a pitchfork). She was visited by Larry the Cable Guy, “CBS This Morning” and a parade of media. But she taught her last pie-baking class Aug. 22. Monday was Howard’s last day in the house. She locked the door behind her, hopped in her Mini Cooper and strayed farther southeast to her friends’ 1,200-acre farm in rural Lee County. The 700-square-foot home, built in 1881-82, was immortalized as the backdrop for Grant Wood’s 1930 portrait of his pitchfork-wielding dentist and the artist’s sister, Nan – likely the most parodied painting in history. That enduring fame (and an ease of parody that eclipses even the Mona Lisa) has ensured a steady stream of tourists who pose in front of the house and visit the American Gothic House Center next door. Needless to say, Howard had to keep her curtains drawn most of the time. One winter day, a tourist “had her face pressed up to the kitchen window and I was sitting right there,” Howard said. You have certainly contributed to the body of work on this one. Yes. Between the cover of my book and the hundred or so cartoons on this site, I made my contribution to the American Gothic parody genre. A demand problem = a valuation problem. These folks are not “pent-up demand” accumulating on the sidelines, as the wishful thinkers have proclaimed. In Southern California, in the six-county Southland, sales dropped 7.7% in August from July, though they normally rise on average 3.7%. Year over year, sales plunged 19%, the worst August in four years. In Los Angeles, sales plummeted 19%, in San Bernardino 21%, in Riverside 23%. according to a Harris Poll on behalf of electronic broker Redfin, 92% of millennials who don’t already own a home do not plan on buying one in the future. Ever. Now that’s an intractable problem with demand. Orange County, the most expensive market in Southland, is leading the way: about a third of the asking prices have been cut. The dream is over: the price bubble that lasted for two years and that peaked in June with a year-over-year gain of 28% – even as volume was already plunging – has popped. While a lot of sellers are cutting their asking prices, others do what sellers did when the last bubble began to implode: they pulled their homes off the market for a few months, hoping for better times. I think what people are forgetting is that the market bottomed less than 3 years ago and there were many opportunities to buy a home at bargain basement prices and rates. The problem is that many millenials, not knowing any better, bought into the lies being peddled by bears that housing still had further to fall and that prices would generally remain flat for the next 10 years or so. Those of us that spoke the truth and advised buying near the bottom of the cycle were renounced as ‘Kool-aid drinkers’. Don’t worry millenials. Housing cycles go both ways and eventually prices will correct again and come back within your reach. All you need is little patience. Maybe. But be honest – way more people people listen to the MSM than they do bears on housing blogs, and the MSM is 90% pollyana unicorns and rainbows. So falling inventory causes prices to rise, or fall? Unless must-sell inventory remains on the market, in large numbers, then the market won’t “implode”. This is just normal price discovery. Sellers aren’t getting their BS make-me-move asking prices, so they are taking their toys and going home. What remains on the market is the market, as it was before. The artificially high inventory was due to the large number of sellers asking for what they could never get. This cloud inventory obscures the true market dynamic by inflating the number of homes listed, versus those actually salable. The housing market may be a lot tighter now than it would appear using traditional market metrics. Those sellers appearing out of cloud inventory asking for sales prices they will never get added to market statistics, but they never were participants in the market. If anything, they show how much overhead supply exists when prices go just little bit higher. And Dom’s point about the financial media is accurate. Between their desire to pander to people’s desire for good news and the support they get through advertising from realtors, newspapers are 90% pollyana unicorns and rainbows. I disagree. I’m Generation X and live in San Francisco (I don’t buy 8-dollar hotdogs but I do have sky-high rent). I would have loved to purchase a house in SF or Berkeley in 2010 (even haunted redfin) but frankly I couldn’t afford it. I make a decent living but you need to have several $100k saved unless you want a suicide loam, and I prefer sleeping at night to lying awake worrying about getting laid off. While maybe there were bargain basement prices in Riverside and Las Vegas prices didn’t fall much in the desirable areas of the SF Bay Area, just like they didn’t fall much in Newport Beach or Turtle Rock. My point is a lot of first-time buyers couldn’t afford the “bargain basement” prices of 2010, just like they can’t afford the current higher prices. That’s a good point. The chronic shortages of housing supply inflates California house prices, and that means the most desirable areas are always out of reach. This is a major long-term problem in California, and I don’t see this changing any time soon. I still remember sitting in a restaurant with my parents in 2011, having a discussion about housing and them urging me to get into the market. I shared my opinion – largely formulated from this website & IHB – that there was no rush and that we were going to be experiencing a long swoon in prices due to shadow inventory. By the time my wife and I started to look in Sept. of 2012, it was too late. The first 4 properties we bid on had multiple offers, all of them 5% or more over asking. It wasn’t making headlines yet in the media, but the bull market was underway. We ultimately found an acceptable home, made an asking price offer within 2 days of the listing and were accepted. Ultimately the offer price was more than I wanted to pay, but those were the conditions at the time. Despite that, I don’t consider the information that factored into my decision to be “lies.” The banks decision to withhold inventory (or in many cases, sell in bulk to “REO to Rental” outfits) was not really forseeable. Larry has provided so much valuable information to me and countless other readers over the course of his blogging career that his positive input far outweighed the few missed calls. If it weren’t for Larry and the housing bears, I might have just as easily bought in 2007, just before things fell off a cliff. And I’d like to qualify my comment by saying that Larry wasn’t really a housing bear at that point anymore – as evidenced by his acquisition of significant LV real estate and his emphasis on rental parity. The prediction about the length of the bear market was wrong, but that shouldn’t have precluded anyone who was able to buy in 2011 from doing so, myself included. Trying to time the bottom rarely leads one to a better financial decision. The rapidity of the turnaround surprised everyone. I didn’t think a cartel of banks could successfully band together and decide to stop foreclosing and stop approving short sales to dry up the market supply. A housing market has never formed a “V” bottom before, but then again, a housing market has never been so heavily manipulated before either. And since this was a bottom engineered by a supply restriction, the supply restriction occurred first, so by the time people began to realize prices were bottoming, the supply was already gone. As you noted, there was no time to change your mind. The only people who were successful at getting a good deal were those who bought on faith while prices were still falling. It’s much easier to have that faith when the cashflow is good, as I did in Las Vegas, but it was much more difficult to make that call in Coastal California where prices never dropped so far as to give a clear signal. There were plenty of cashflowing deals in OC from 2009-2011. The condo complex where my condo is located got swarmed with investors who recognized the opportunity and helped set a bottom in pricing. That was how I knew prices wouldn’t be falling much further. There was no faith involved. When I used to bring it up, the housing perma bears would either laugh or attack me with accusations of being a shill or cheerleader. Nonetheless, I took my “faith” and bought a house based on the simple fact that it was cashflow neutral, so there would be no financial benefit to renting. I guess my only faith was in the OC housing cycle and the fact that I believed prices would rise dramatically from the bottom. The reason I believed this would happen is because it has always happened after bad recessions and I wasn’t convinced that this time was different. Where it has been different is that this cycle was cut short by the lack of affordability products. Ordinarily, we would have gotten 3 to 5 years more out of the rally with the proliferation of toxic mortgages. Indeed.. Which is why there seems to be a scramble to reintroduce them before it’s too late. So many folks dropped out of the labor force during the recession, and there is a long way to go before we reach historic norms. I remain skeptical about rate increases as well, unfortunately. The red line showing the working age population strongly suggests the problem is not structural as the federal reserve study suggests. Unless the aging and retiring baby boomers causes that red line to fall to meet the labor participation line, there is still significant unemployment slack in the economy. Of course, that could be good news for the long-term prospects of housing because eventually, those people will go back to work and demand housing. A few observations: first, this chart is for full-time employment only. It doesn’t take into account the rise in part-time employment since the recession. Second, the participation rate has risen substantially since 2010. From 111/126 = 88% to 93% today. Third, the actual employment is rarely equal to, much less above the working age population line. In fact, the only time the two are close is right before a recession hits. Fourth, where did the .001 and .78 multiplying factors come from? And why are these assumed constants and not variables? Fifth, how does this chart take into account the fact that workers are delaying retirement? Has delinquency and foreclosure crisis 2.0 already begun? The total number of homeowners receiving permanent loan modifications declined in July, as did the number of modifications made under the Home Affordable Modification Program (HAMP), according to figures released this week by HOPE NOW. Including both HAMP and proprietary programs, permanent completed modifications totaled 35,402 in July, according to HOPE NOW, down from 38,489 the month prior. The decline reflected a drop in both the number of proprietary mods, which totaled nearly 25,000 compared to June’s more than 27,000, and in the number of HAMP mods, which fell to 10,177 from 10,813 in June. Since 2007, HOPE NOW estimates nearly more than 7.1 million homeowners have been granted a loan modification, including 1.4 million made through HAMP (dating back to 2009). Factoring in short sales, deeds in lieu of foreclosure, and other workout plans, the group reports that servicers worked with homeowners to come up with nearly 157,000 solutions to avoid foreclosure. Meanwhile, foreclosure starts rose a little more than 1,000 from June to settle at 70,401, the highest level of starts since January. Through the first seven months of 2014, foreclosure starts totaled nearly half a million; for all of 2013, starts came to an estimated 1.2 million. Meanwhile, completed foreclosure sales rose to 38,428 compared to 36,826 in June. Extrapolating from data provided by the Mortgage Bankers Association (covering approximately 88 percent of the industry), HOPE NOW estimates the number of loans with delinquencies of 60 days or more came to nearly 1.86 million, down from 1.88 million in June. The percentage of total loans overdue by 60 or more days stayed constant for the 11th straight month at 4 percent. Builder confidence in the market for newly built, single-family homes rose for a fourth consecutive month in September to a nine-year high. The National Association of Home Builders/Wells Fargo Housing Market Index, released Wednesday, hit 59 — the highest level since November 2005. Ironically, despite this week’s gains, mortgage applications are at a 14-year low. I think it depends on how many baby boomers actually sell. Here is a study from 2006, where 70% of baby boomers said they were unlikely to sell after retirement. Considering Prop 13, and probably equal or less equity now than 2006, it is unlikely that more than 70% are likely to sell after retirement today. Even if ALL baby boomers sell, they have to live somewhere. So a baby boomer sale creates supply AND demand. And since baby boomers are downsizing, demand rises in the mid-tier price range based on cash-rich retirees entering this market segment. A lot of these baby boomer articles are mere supposition. I haven’t seen a good article detailing that baby boomers are selling their homes in mass and causing prices to fall. In fact, I haven’t even seen a study showing that this is likely to occur. I think it is more likely that baby boomers will retire-in-place, taking advantage of Prop 13, instead of selling and buying a smaller place with much higher carrying costs. And many boomers have generous pensions and full social security benefits, in addition to retirement savings. The bigger concern is what happens when Gen X decides to retire twenty years from now (or has it decided for them). With little in the way of direct pension benefits, and the Social Security fund being drawn down, pressure to sell will be much greater than it is for boomers today. Even if ALL baby boomers sell, they have to live somewhere. So a baby boomer sale creates supply AND demand. And since baby boomers are downsizing, demand rises in the mid-tier price range based on cash-rich retirees entering this market segment. Most baby boomers won’t sell while they are young and healthy, but eventually, they will want to downsize. The idea that they are cash-rich may or may not be true. Many already HELOCed themselves into poverty, and many more will take out reverse mortgages and give their houses to the bank, so when they do finally sell, they may not have much equity to make another purchase. I don’t think baby boomer sales will cause a crash at any price point, but whatever this generation does, it will impact the market. They always have. California is perhaps one of the most important states in mortgage finance. So much of the mortgage finance world is based in California and, like Texas, the industry is a huge source of employment for workers of varying levels of education. Beacon Economics famously pointed to factors in the Golden State that will lead to a continued, strong housing economy. Home sales are estimated to continue on their upward trajectory over the next two years; however, the pace of growth will cool to the 4% to 6% range, a rate more in line with income growth. Home sales in California are forecast to rise by double-digit percentages in 2015. Plus a report yesterday from the California Association of Realtors also had some good news. The main finding from that report is that the August 2014 price for the average home in California was the highest observed since 2007. The median price of an existing, single-family detached California home rose 3.3% from July’s median price of $464,750 to $480,280 in August and up 8.9% from the revised $441,010 recorded in August 2013. And according to Property Radar, year-on-year the numbers are much less positive. August 2014 sales are actually down 13.5% from August 2013. “Median prices fall in half of California’s largest 26 counties,” the report reveals. According to Property Radar, there are three things that could pop the California real estate market. Yes, this is literal.There is not more money coming into the California real estate market, there is actually much, much less. Cash sales totaled 7,547 in August and were 22% of total sales. Cash sales have been steadily declining, down 46.2%, since reaching a peak of 14,028, or 40% of total sales in August 2011. “Hey honey, let’s use our extra cash to buy a home, refurbish it and quickly sell at a profit,” say fewer and fewer people in California. According to Property Radar, flip sales fell 2.3% for the month and are down 36.5% for the year. Flip sales are defined as properties that have been resold within six months. Flip sales peaked in October 2012 and have declined 38.2%. California real estate is also quickly losing the attention of corporate money. Institutional Investor purchases edged up 0.9% for the month but are down 23% from August 2013. As the supply of distressed properties dwindle and prices rise, institutional investor demand has retreated due to the lower return on investment. In general, institutional purchases have posted consistent monthly declines since peaking in December 2012 and are down 43.9% since then. Trustee sale purchases by LLCs and LPs are down nearly 83.6% from their October 2012 peak. Realtytrac picked up on Monday’s post. After the housing bubble burst in 2006, it ushered in the foreclosure crisis, with 5.5 million borrowers losing their homes to banks. Now that the foreclosure tidal wave has receded, most believe that the foreclose storm is over. Nationwide, foreclosure activity is down 9 percent from a year ago in July, according to RealtyTrac — the 47th consecutive month where foreclosure activity decreased annually. But the foreclosure numbers could start to trickle upward starting in 2015. A new potential wave of mortgage trouble could threaten the shaky residential real estate market. In other words, the foreclosure crisis hasn’t receded; it was delayed. The can was kicked down the road. And next year, foreclosure activity could spike again. Now the chickens are coming home to roost. Already, nearly 400,000 have re-defaulted on their HAMP modifications. Between now and 2021, almost 90 percent of the HAMP loan modifications will see increases in their mortgage interest rate, including almost 300,000 next year, according to the SIGTARP report. And with almost half of homeowners who got help in 2009 re-defaulting on their mortgages, we could see a spike in foreclosures in the next few years. This won’t lead to much of a spike in foreclosures. The people from 2009/2010 who default, will then be re-qualified under HAMP 2. Those that don’t qualify will result in short sales or DIL’s under HAFA. If they don’t qualify for these other government programs, they will then be evaluated for in-house mod and short sale programs. In other words, there’s no reason to think that the trickle will become a flood. Lenders have become expert and metering out the flow of bad properties to avoid a crash. The next downturn will be different; it will start with a big drop in volume, and instead of following with a drop in price, we will just get another big drop in volume, probably bringing sales to new record lows.